W is for…What Else Could It Be? Naturally I had to rejoin the Gould Genealogy Family History Through the Alphabet Challenge at “W”. W is for Western District and that means a lot to me not only because this blog “Western District Families”. I was born and raised in the Western District and all the families of my maternal lines, going back six generations, chose to settle in the wonderful Western District. One of the highlights of the Western District is the geography. Entering from the east, the Western Plains lead to the rise of the Grampians and on to the volcanic plains and green rolling hills beyond. To the south are the forests of the Otways, the south-west coastline and volcanic Tower Hill. And there are the rivers, meandering through the countryside to the sea. I will take you on a geographical journey through the Western District, just a glimpse really, beginning with two colonial artists, Nicholas Chevalier and my favourite, Eugene Von Guerard. These artists and others traipsed around Victoria sketching and painting. Von Guerard also travelled to Tasmania, New South Wales, South Australia and New Zealand. Looking at their paintings reminds me of the lives they lived for the sake of their art. 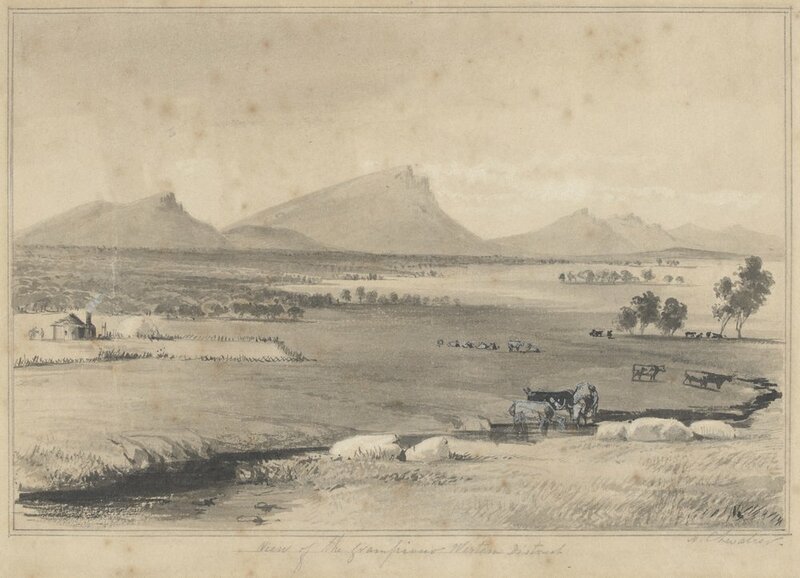 Chevalier’s sketch shows the Serra Range including Mt Sturgeon and Mt Abrupt at the southern end of the Grampians. 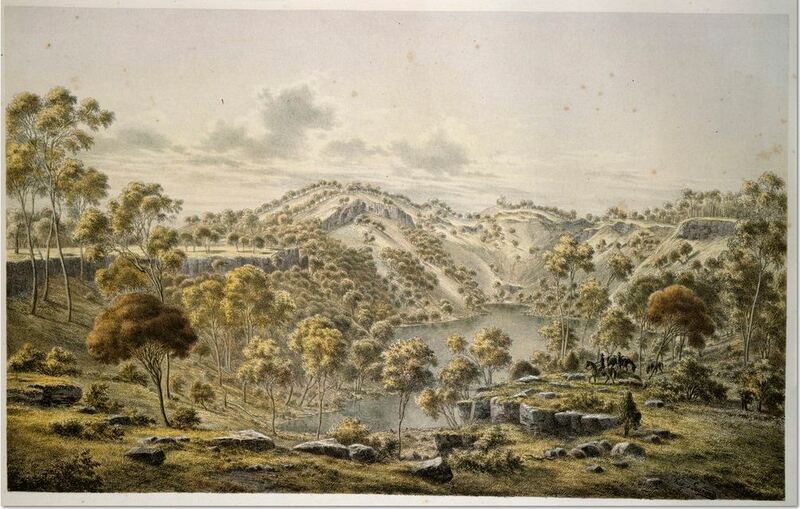 View of the Grampians, Western District [art original] N. Chevalier. Moving south-west, dormant volcano Mt Eccles near Macarthur has played a part in my family history. 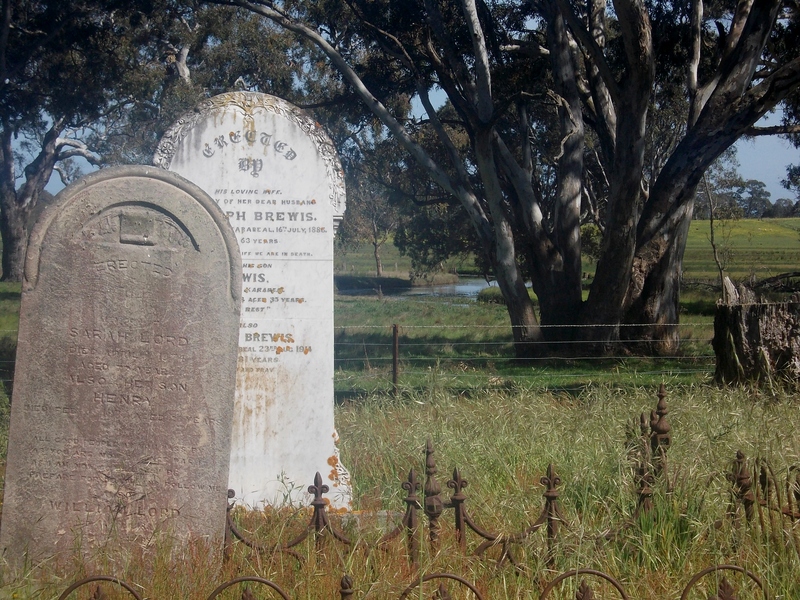 My gg grandfather Reuben James Harman, son of James Harman, owned property at Mt Eccles. It was also a favourite fishing spot of my grandfather Bill Gamble. Crater of Mt. Eccles, von Guerard, Eugene,1811-1901,artist. I prefer von Guerard’s depiction of Lake Surprise, the crater lake of Mt Eccles, to my own (below). I remember as a child asking about the name “Lake Surprise”. The answer: When you get to the top of the crater and see the lake, you get a surprise. Fair enough. It’s the photo of my grandfather Bill Gamble during the 1930s that is my favourite. A little north of Mt Eccles is the volcanic lava flow, the Harman Valley at Byaduk, named after my Harman family. In the distance is the source of the lava, Mount Napier. 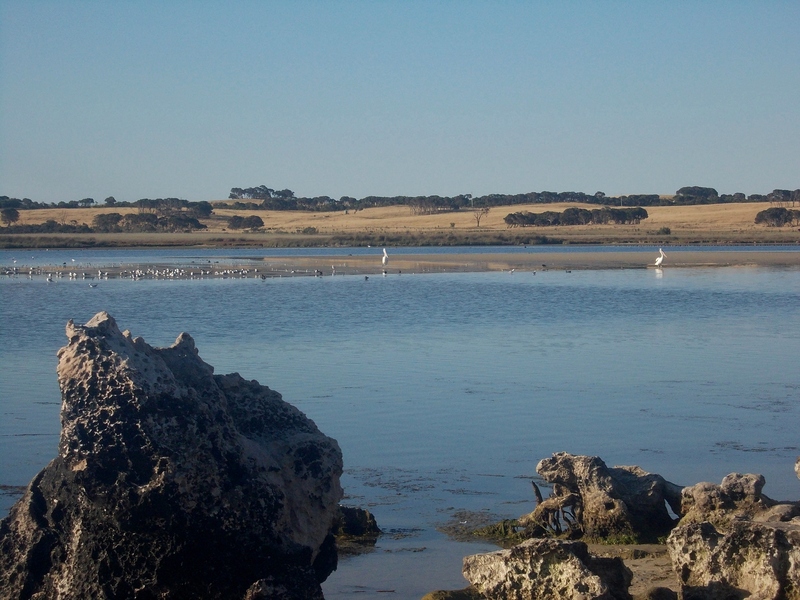 South of Mount Eccles is beautiful and historic Port Fairy, the last port of call for the Moyne River, with its origins east of Macarthur, before it reaches the sea. 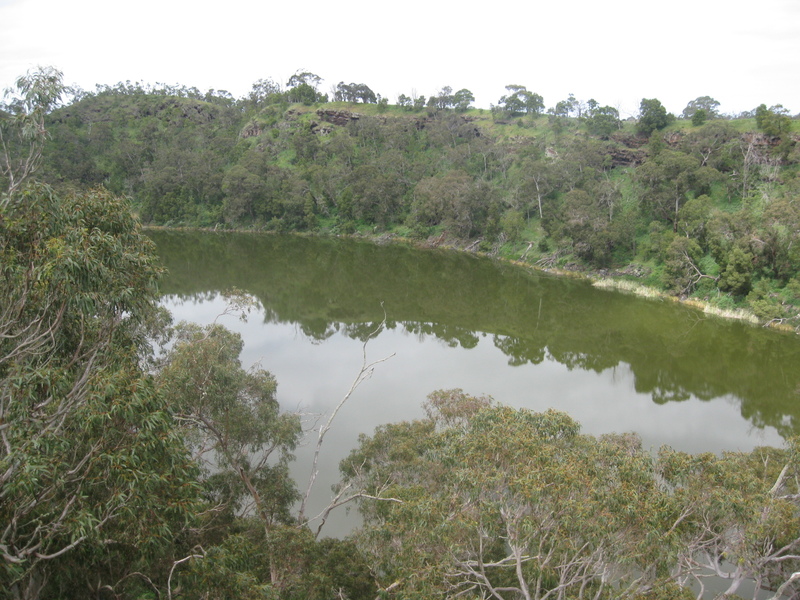 Moving east from Port Fairy is Tower Hill, another dormant volcano. 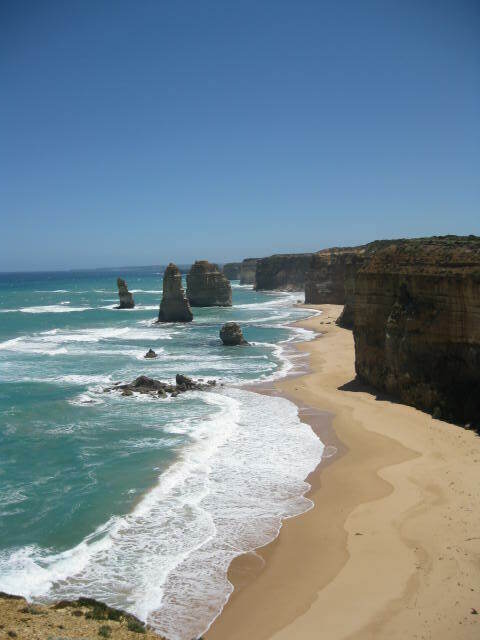 South-east of Warrnambool is the famous Loch Ard Gorge, named for the Loch Ard which wrecked on the treacherous coastline. 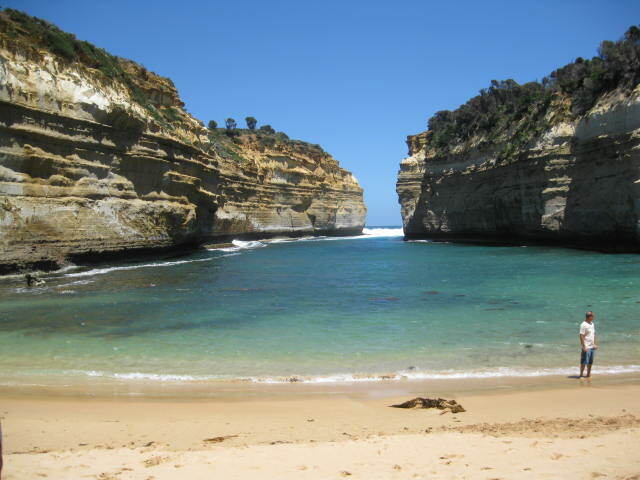 The only two survivors, Tom Pearce and Eva Carmichael were washed on to the beach at Loch Ard Gorge. I find standing on the beach in the Gorge a haunting experience. East along the coast line is one of the most iconic views, not only of Victoria but Australia. North-west, and back where we started, are the Grampians. The Wannon River begins its’ flow at the base of Mt Abrupt in the Southern Grampians. 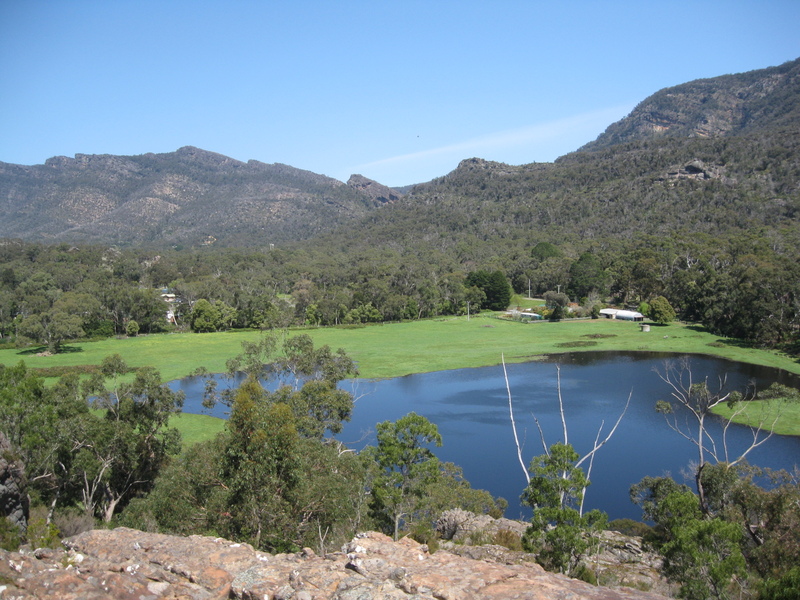 It flows toward Dunkeld, around the base of Mt Sturgeon and leaves the Grampians heading north-west toward Cavendish. Along the way it passes by Mokanger, the workplace of both the Mortimers and Haddens. 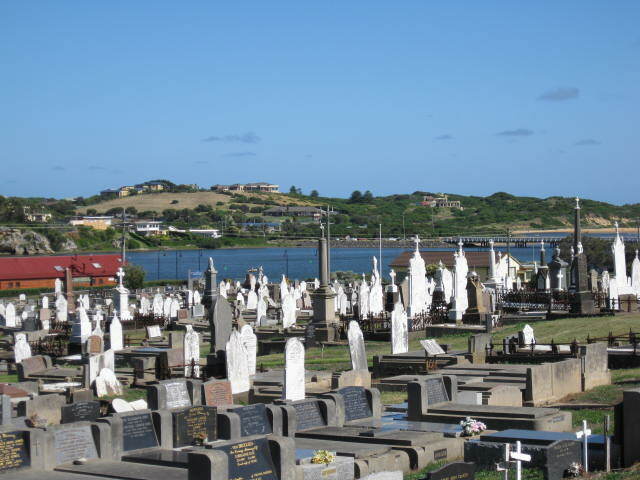 Through Cavendish, it passes close to the cemetery, burial place of members of those two families. 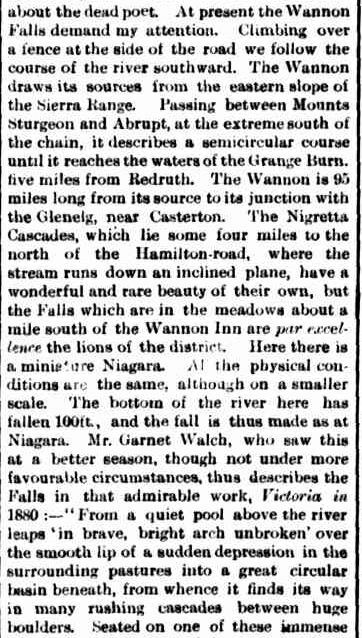 From Cavendish, the river begins a southward journey toward two of the Hamilton district’s jewels, the Nigretta and Wannon waterfalls. As the river progresses west, the Grange Burn joins the Wannon north of Morgiana, having flowed from just east of Hamilton, the city founded on the Grange. 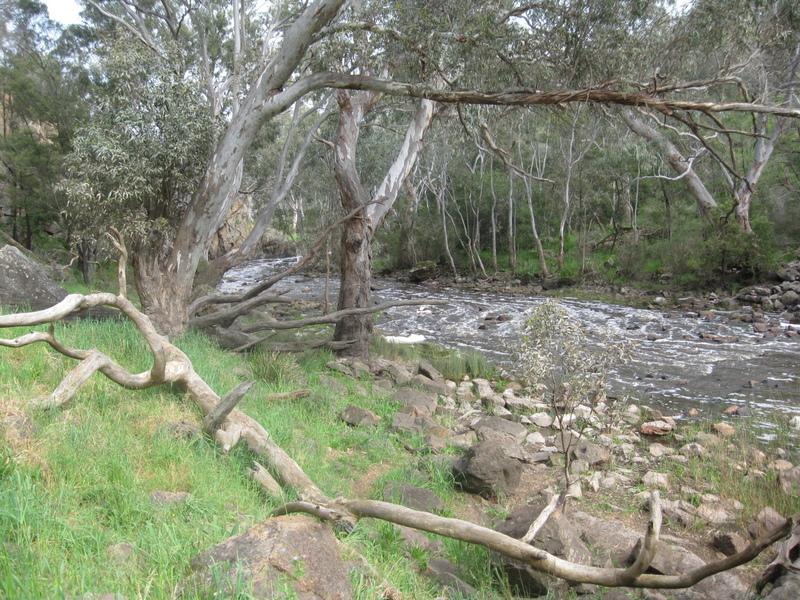 This section of the Wannon river was another favourite fishing spot of my grandfather Bill Gamble. On the river flows to Tahara and then Sandford. I have family links to Sandford with Julia Harman, daughter of James Harman residing there with her husband George Holmes. Two children were born at Sandford including WW1 casualty Arthur Leonard Holmes. My gg uncle William Diwell also spent some time around Sandford. In 1914, he completed extensions to the St Marys Church. 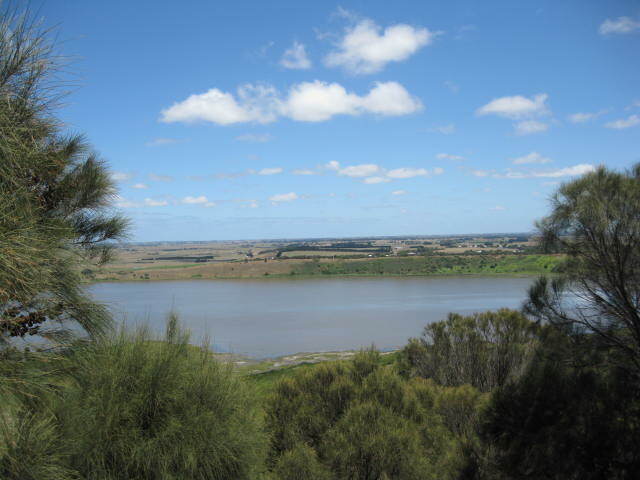 The Wannon River then joins the another great river of the Western District, the Glenelg River, having passed through some of Victoria’s most beautiful countryside. It is not surprising Joseph Hawdon, travelling overland to Adelaide with Lieutenant Alfred Miller Mundy of the 21st Regiment in 1839, endorsed Major Thomas Mitchell’s description five years earlier. 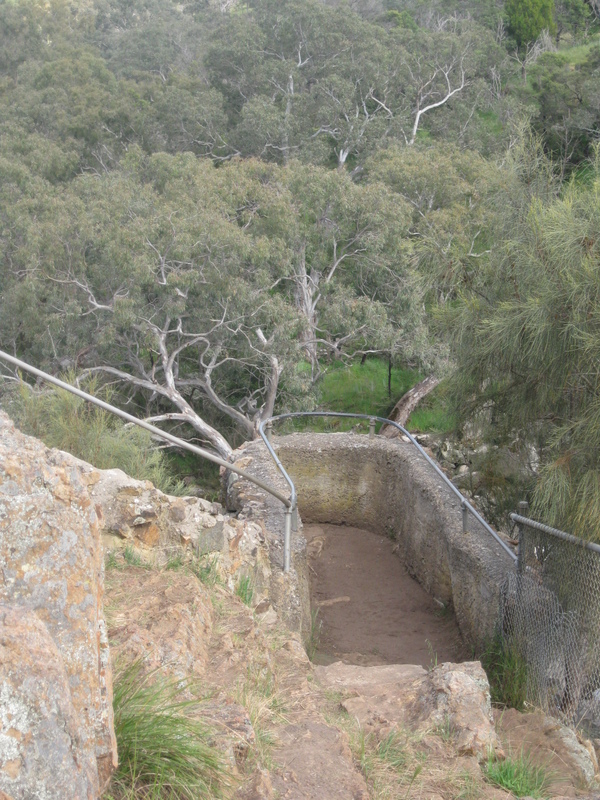 Major Mitchell followed the Glenelg River from its beginnings in the Grampians through to the sea at Nelson. It is little wonder all my direct ancestors stayed in the Western District after settlement. He even dived for the bones of Robert and Mary Hunt, murdered by George Wains in 1860. By the time the Glenelg River reaches the sea, it, the waters of the Wannon and Grange Burn have passed by many of the places my ancestors lived, worked, fished, swam and were laid to rest. 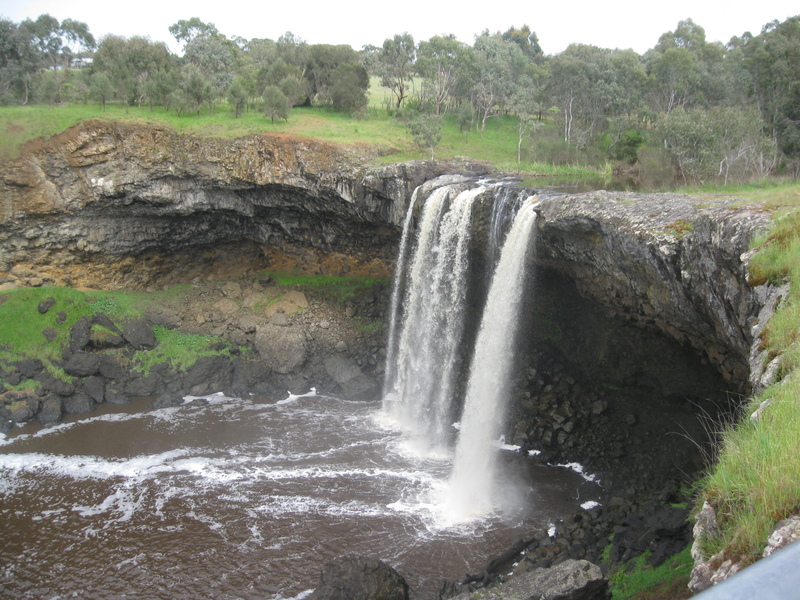 The Wannon River between the Nigretta Falls and the Wannon Falls, about twenty kilometres from Hamilton, would be the section most frequented by myself and my family before me. My own memories come from family visits, Sunday drives with Nana, school excursions and birthday parties. 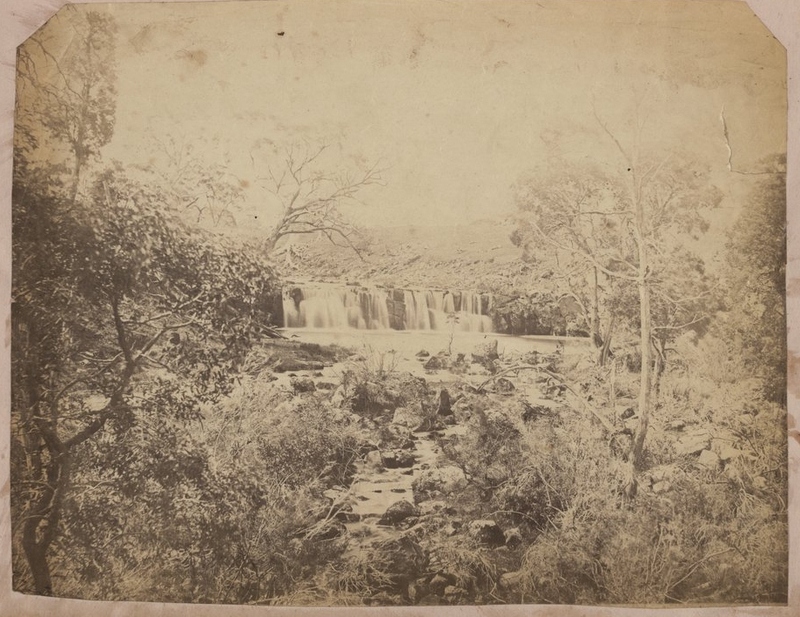 The following views near the Wannon Falls are from the State Library of Victoria Collection and were captured around 1878 by Thomas J. Washbourne , a Geelong photographer. 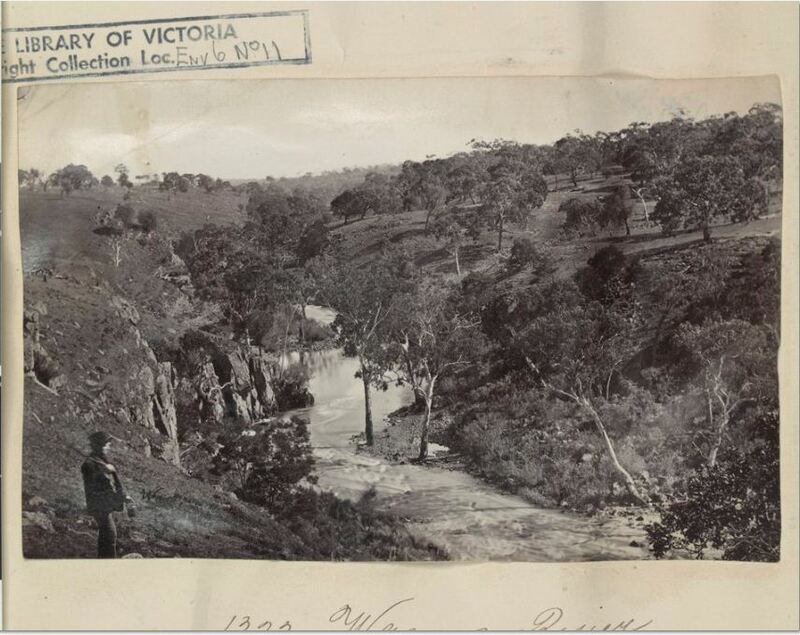 Wannon River Scene Washbourne, Thomas J.,photographer. Of the two waterfalls, I prefer the Nigretta, especially after rain. 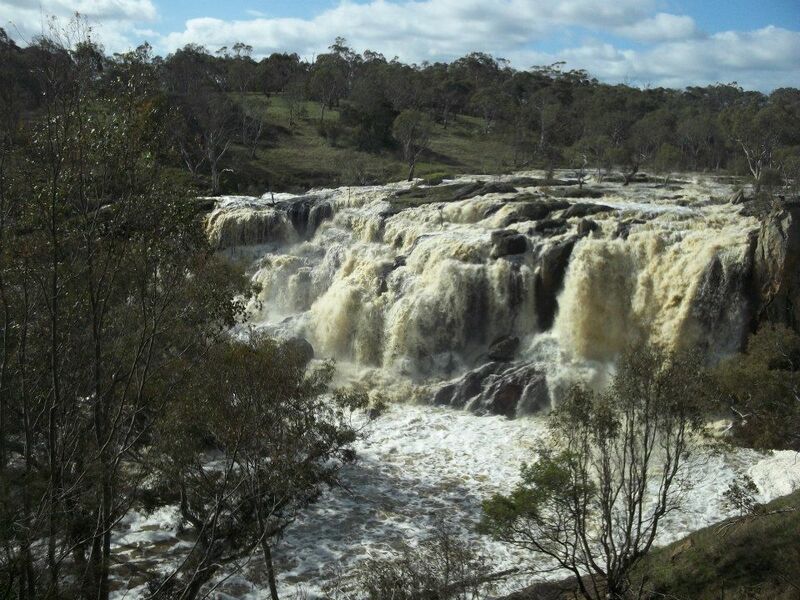 The Wannon Falls could be described as pretty in the way the water drops off the edge, but the Nigretta Falls are, at times, spectacular. 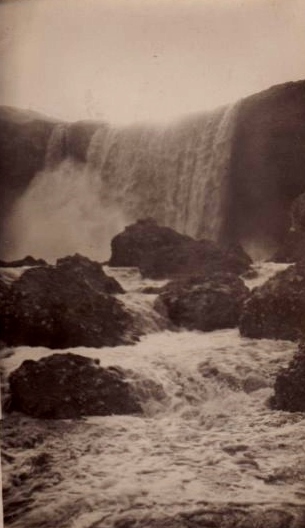 This photo taken in August this year by my friend Catherine, after some good rain, sees the Nigretta looking like the miniature Niagara Falls described by The Vagabond. 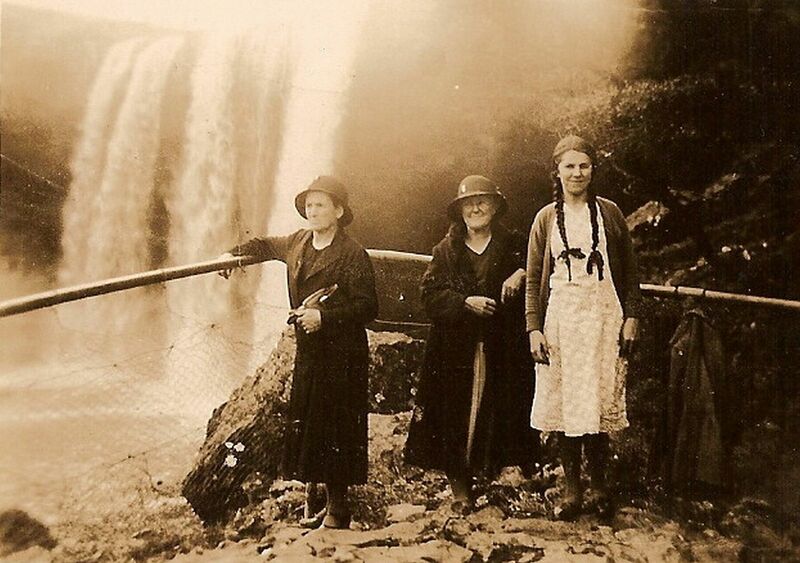 It was pleasing to see that the old viewing platforms still remain at the Nigretta Falls. An impressive wooden staircase now leads down to the falls, but the original steps remain. 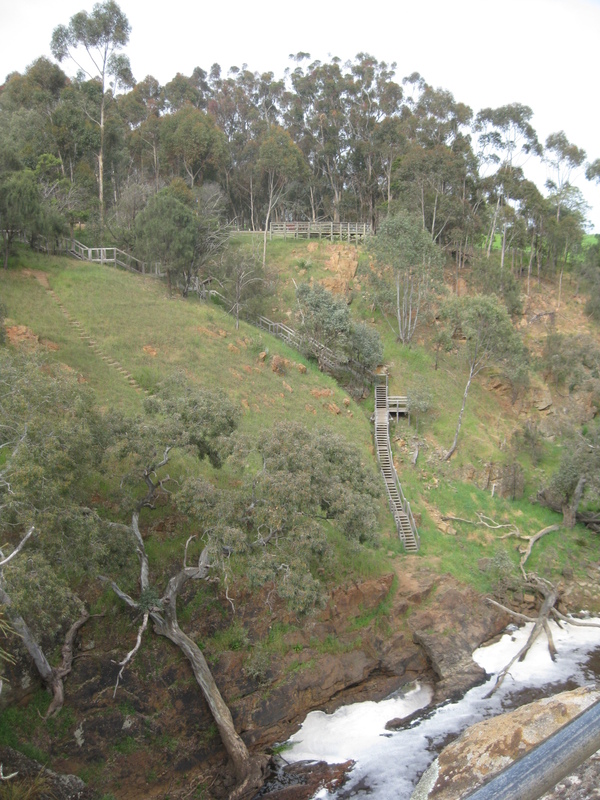 The Wannon Falls (below) holds memories of walking beyond the viewing platform, down to the rocks and behind the falls, but only when they were flowing lightly as they are in this photo. A new viewing platform now prevents such precarious escapades, even undertaken while on school excursions! 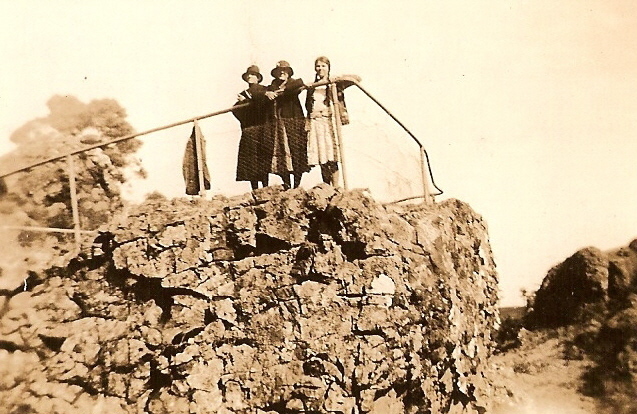 The topic of the Wannon River gives me an opportunity to share my all time favourite family photos. As a little girl when I first saw Nana’s old photo album, these photos captured my imagination. When Nana came to live with us she kept her photo albums in her wardrobe. I would take them down, sit on her bed and go straight to the photo below. It was near the beginning of the album which had black, much turned pages. From right: Nana, (Linda Hadden), my great-grandmother (Sarah Elizabeth Harman) and my great auntie Alma’s (Nana’s sister) mother-in-law Mrs Issac William Short (Catherine Gissane Tilley). They are standing on the original lower viewing deck. 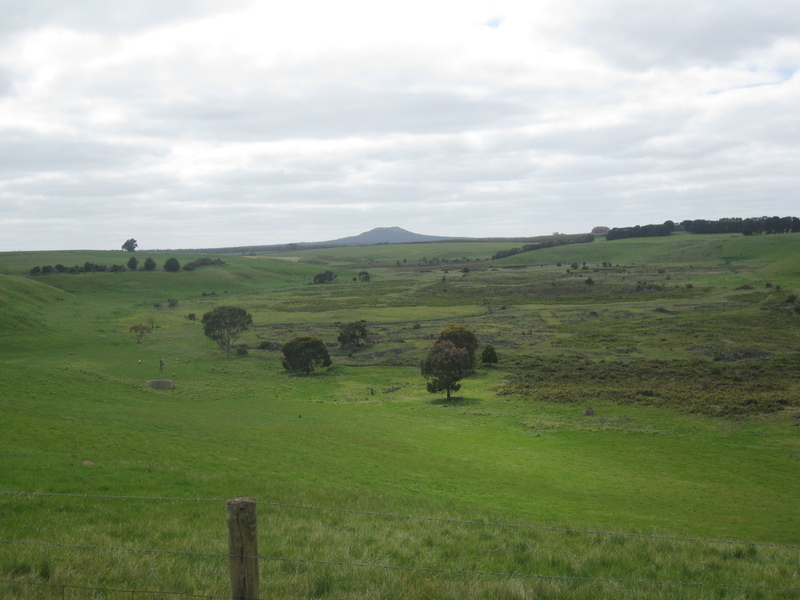 The photos from a day at the Wannon where originally very small. It wasn’t until I enlarged them on a computer, that I noticed Nana’s coat hanging on the railing. I think the reason I like this photo is because Nana looked exactly liked she did when I knew her, but with long braids and I still can’t believe she was only about fifteen. Even the small research assistant thought Nana was the lady in the middle when he first saw it. He only knew her as an older person and does not think of her as having been a child too. The second photo was taken from the lower viewing deck, looking toward the upper level. I didn’t like standing here as a child and as you can see the rail was high at the front and difficult to see over and to the right of Nana was a gap between the fence and the rocks. I much preferred the lower deck. 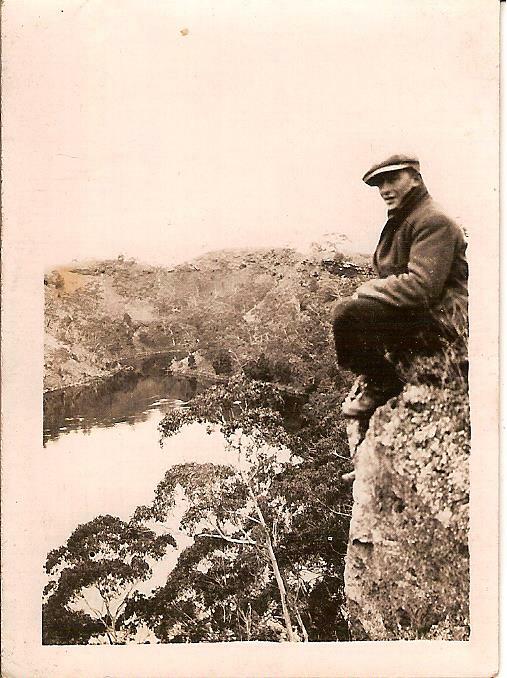 My grandfather Bill, before he married Nana, liked to visit the Wannon Falls too, although he didn’t stick to the viewing platforms. 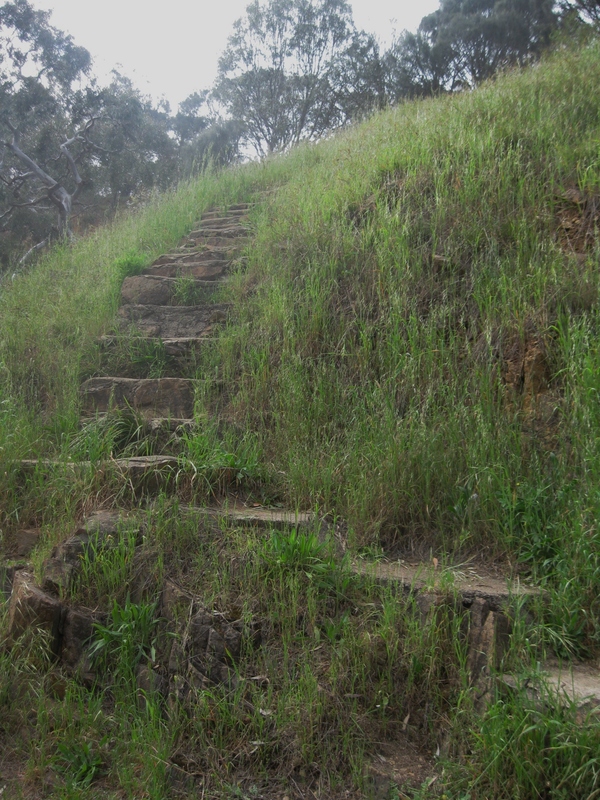 In more recent years, a rotunda was built at the Wannon Falls reserve with information about the waterfall, the local geography and history. On our visit, the small research assistant said “Look Mum, they even have family history here for you” He was right. 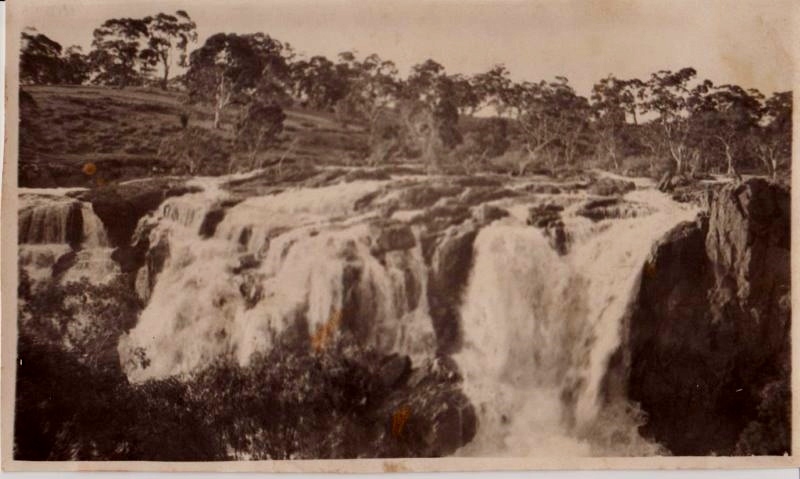 There is a lot of my family history at the Wannon Falls. 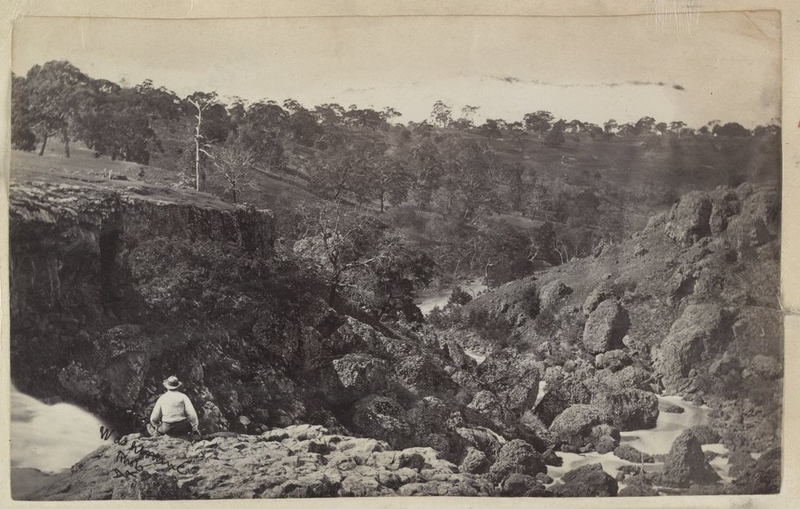 This entry was posted in Gamble, Hadden, Harman, Western District History and tagged Casterton, Diwell, Gamble, Glenelg River, Hadden, Harman, Holmes, Jelly, Major Mitchell, Mokanger, Mortimer, Nigretta Falls, Sandford, Wannon River. Bookmark the permalink. Thanks for taking us on a tour of the diverse Western District Merron. I love how you have blended photos old and new with those lovely paintings. I was impressed by the Nigretta Falls. Love that photo of your grandmother and great grandmother.. A true family treasure. A very comprehensive blog. Well done. What a wonderful post Merron. You should be a tour guide! I’ve not seen much of the Western District but your post has made me put it on my “to do” list. Thank you. Lovely and totally inspiring Merron! A beautiful post Merron. And I LOVE the photos, the old and thew new, as well as the memories. It is easy to see that this is a very special place for you. Wow, what a wonderful post. Enjoyed learning aboutt your area from my hotel room in Polabd. You should Aillin. Lots to see and do & loads of history. I really enjoyed your post Merron. 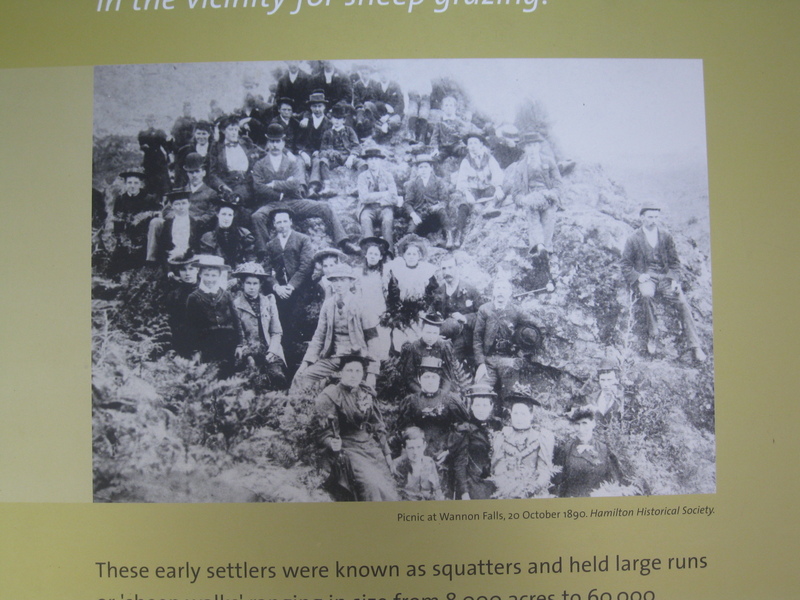 History and Travel interwined…..my two favourite pastimes. You did make me think I should spend some more time in the Western District! Thanks Sharon. There’s plenty of history in the Western District. 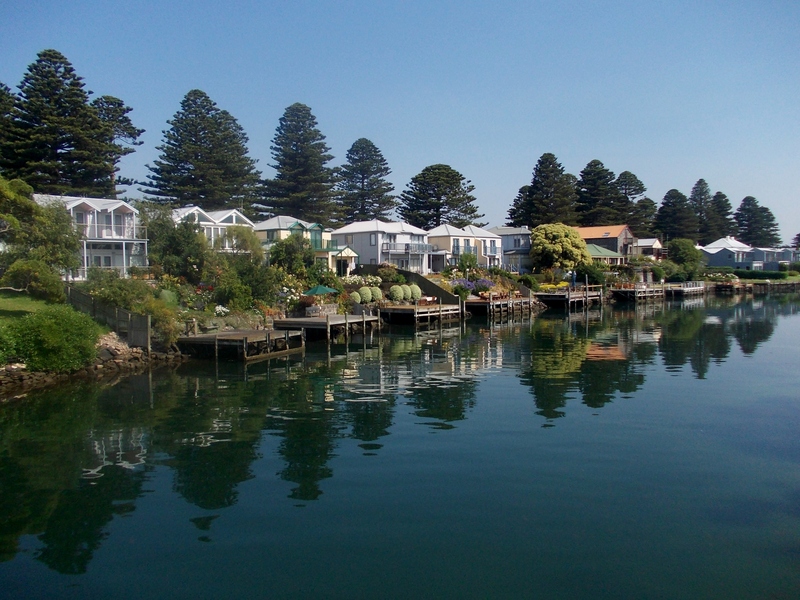 I didn’t even mention one of my all time favourite spots Port Fairy, it’s got it all.